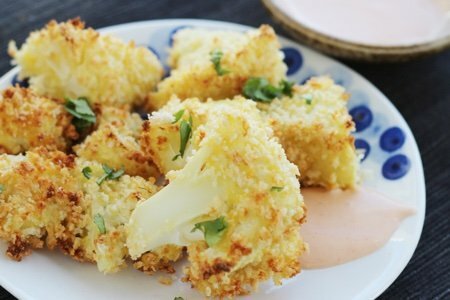 This crunchy cauliflower recipe is your go-to appetizer for the Super Bowl! I have been criticized for my love of cauliflower but I continue to cook with it no matter what the consequences. I have also been criticized for cheering for the New England Patriots but I LIVE IN MASSACHUSETTS. Whataya gonna do? 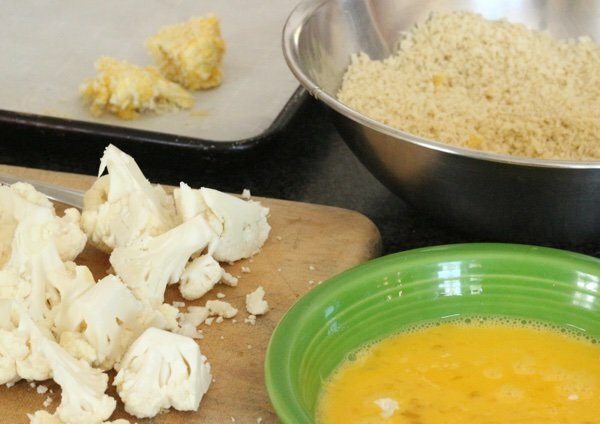 One of my favorite cauliflower recipes is incredibly simple – Smoky Cauliflower Recipe. All you do is roast it and add smoked paprika. The cauliflower in this cauliflower crunch recipe needs some kind of sauce to make it work. I mixed mayo and Frank’s Red Hot but you could use a less calorie sauce such as green salsa or simply Frank’s Red Hot (which has zero calories). Heat oven to 400 F. Line a rimmed baking sheet with parchment paper. 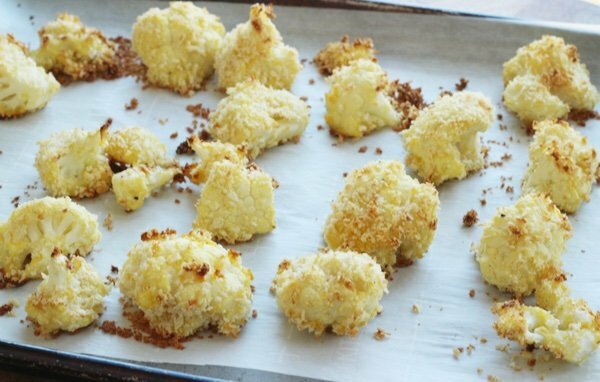 Dip cauliflower pieces into egg and then bread crumbs. Place on parchment paper and bake for 20 minutes until lightly browned and crunchy. Season with salt and freshly ground pepper,. Serve hot with sauce on the side. I'm curious: what's the difference between panko breadcrumbs and other breadcrumbs? I feel like I should know this, since I lived in Japan, but I happen never to have cooked with them! They are super crunchy and more coarse than regular bread crumbs. Imagine croutons that you put in a dish towel and used a rolling pin to crush them but only enough to make crumbs the size of quinoa grains. Looks tasty. And so much healthier than any bagged snack! 2 extra bites and you've had an egg. Is there an eggless way to get crumbs to stick? We are trying to not eat any fat, and especially saturated fat in our house. Maybe a mist of olive oil and panko to bake then a hot sauce-only dip? Any other ideas? BarbL - Try substituting 2 egg whites for one whole egg to avoid the fat in the yolk. I am delighted to find cauliflower tator tots, cauliflower made to look like mashed potatoes in the store. My hubs detests any veggie except corn ..yuck, so I am trying to squeeze these products in to our regular dinners! 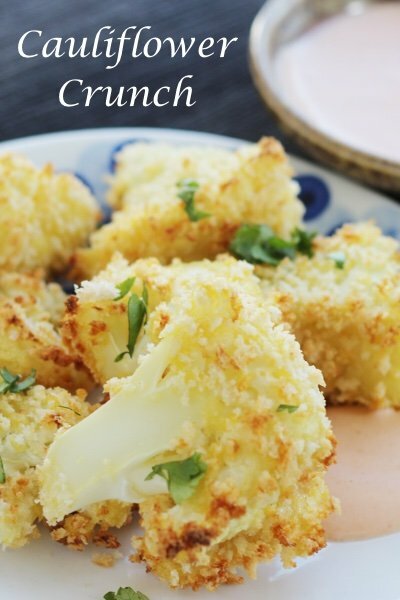 I love cauliflower so I really need to try this recipe. I love roasting veggies. A few days ago I saw Muhammad Ali’s daughter talk about a white sauce made with cauliflower. The next day there was your recipe for the same thing! I tried it tonight in a pasta casserole, and my husband just went back for his third helping! Since it was for just the two of us, I did use my hand blender as we didn’t care if there were cauliflower pieces in it. I was surprised at how liquid it was, and how it thickened up while baking. Excellent!!!! Hi, does the cauliflower need to be fresh? Or would Frozen work as well? Amazing!!!! This was perfect to eat while everyone else was eating their snacks during the Super Bowl. Totally making this many more times! @Carolyn: Thank you! Aquafaba sounds intriguing. I must experiment with it one day because I'm using garbanzos on a regular basis and discarding a lot of good juice. @Joan: Thank you! Good to know. I've had success with flax eggs in brownies but not so much in corn bread due to taste [so the birds got that batch then I found Bob's Red Mill egg replacer which worked perfectly]. 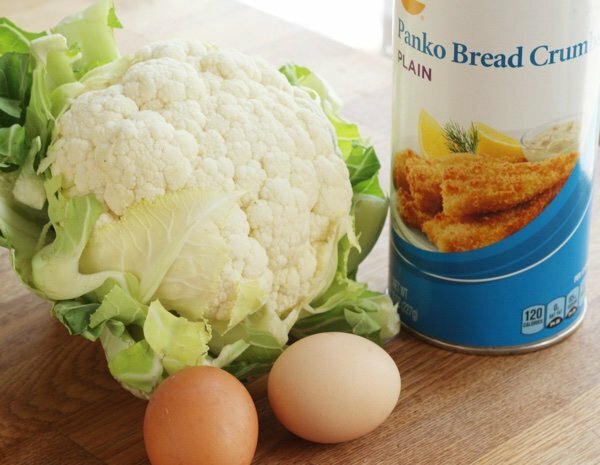 I'll definitely do a flax egg substitute for this cauliflower recipe. Always looking for ways to get some freshly ground flax seeds in me every day. @BarbL, As for flax, I add it to oatmeal too. I prepare a big batch on the weekend, then have some every day. I add mashed bananas, soy milk, anther fruit, such as raisins, frozen blueberries,or dates, cinnamon, and top with walnuts. Works for me. Hubby takes it to work too--it helps his cholesterol. Amazing recipe. This dish looks yummy and healthy too. Cauliflower offers a wide variety of health benefits. Cauliflower is a rich source of vitamin B and fiber. Cauliflower contains fiber that helps with weight loss and provide a healthy digestive system. Cauliflower also contains good amount of vitamin K, which has anti-inflammatory properties. I will definitely try this recipe. I tried this recipe with mushrooms. I broke off the stems of the large ones and breaded them too. Also substituted a flax egg (1 Tbsp ground flax to 2.5 Tbsp water) for each chicken egg; let stand for 5 minutes then proceed with recipe. Delish! THIS IS JUST FABULOUS & EASY. JUST A TIP, I TELL MY FAMILY YOUNG & OLD, AFTER THEY TASTE THE FOOD WHAT IS IN THE FOOD.